In this day and age, everyone is an expert and critic. When it comes to dining out (or eating in, for that matter), customers share their experience with the online world. This has consequences for restaurant owners. Reviews can raise you up or tear you down as a small business owner. How an owner handles a review – good or bad – also says a ton about the business. If your restaurant receives a negative review, showing a positive response might reel in that dissatisfied customer to give your restaurant a second chance. The worst thing you can do from a restaurant marketing standpoint, is not respond. 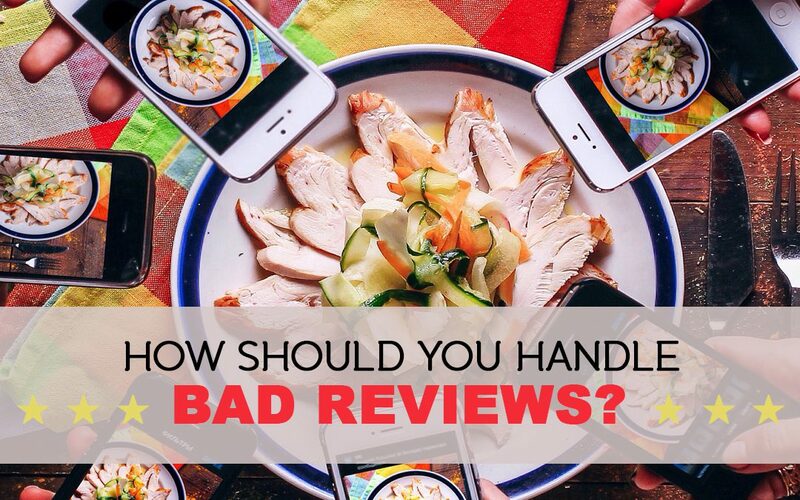 So how should restaurants respond to bad reviews? Diners turn to the internet for guidance on what to eat. Around 33%of frequent restaurant-goers won’t eat at a restaurant with an average review score of less than 4 stars (out of 5) on online review websites like Yelp, Google, and Facebook. This is important to know because if you are a restaurant with less than 4 stars, it’s a red flag that you need to improve the customer’s experience. When you receive a bad review, respond as soon as you can. You should always use an authentic tone and determine the best way to address the issue. Your key takeaway is to pay attention to what your customers are saying. For any positive review you receive, take note as to what you are doing right. For any negative reviews, you receive, acknowledge the mistake or experience and plan steps as to how you can improve the rating for the next potential customer that walks through your door or orders online. As long as you are learning and adapting, you can help improve your ratings. Around 1 in 8 diners will post a restaurant review after their meal. Knowing this statistic is critical to managing your reviews. Your restaurant should work on encouraging customers to review your restaurant. If you know you are going above and beyond in providing the best possible experience to your customers, get them to share their experiences online. Customers are 43% more likely to leave a review after a positive experience at a restaurant. Get these people to share their experience with others. Having a steady stream of positive reviews will easily combat the negative reviews that pop up. So where do you go from here? Consider using these online tools and strategies from Typsy to begin managing your restaurant’s reputation. There are multiple avenues and destinations where a customer’s review could go, and these softwares could help streamline the monitoring process for you.